DERANGED DOC WIG MASK Scary Costume Accessory. Includes attached wig Eye Piece magnifier. This funny yet creepy PSYCHO SURGEON Mad Scientist Wig features a crown of short, wild dark hair, front bald cap section, and even includes the attached headband and novelty magnifier! Insane Asylum Patient or Mad Doctor inspired wig with balding scalp, sparse hair, attached magnifier eye piece novelty magnifying glass, and elastic liner for a good fit. One size fits most adults and teens. Your next fill-in just may be your next drill-in! 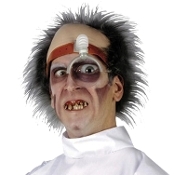 Transform into a mad dentist, scientist or doctor horror character with funny Dr. Killer Driller wig head topper. Comical gag headpiece is just the right accessory to your doctor costume. Hilariously evil! Includes Head Topper Wig Only.